Promotional image for tvN’s “Guardian: The Lonely and Great God”. SEOUL, Jan. 10 (Yonhap) — “Guardian: The Lonely and Great God” topped a TV popularity chart in the last week of December, overtaking “Hwarang” to reclaim its lead, data showed Tuesday. CPI, developed by entertainment company CJ E&M and media tracker Nielsen Korea, measures the popularity of TV shows based on the number of views of related news stories, online search tallies and buzz on social media. Starring Gong Yoo and Kim Go-eun in the lead roles, “Guardian” has kept viewers spellbound with its state-of-the-art computer graphics and cinematography, not to mention its captivating script penned by screenwriter Kim Eun-sook. 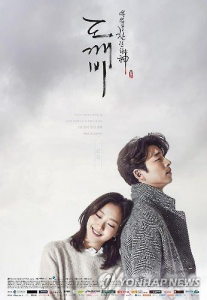 In the fantasy-romance, Gong stars as 939-year-old goblin under the curse of eternal life, while Kim plays a high school senior clinging to him for recognition. 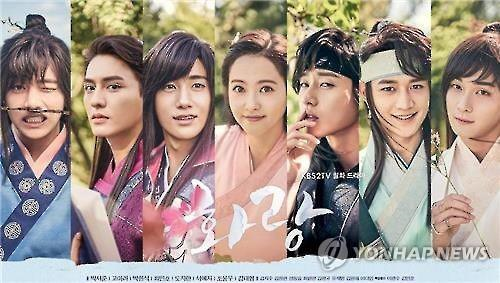 KBS 2TV’s “Hwarang”, an idol-studded period drama based on the Hwarang youth organization during the Silla Kingdom (57 B.C.-A.D. 935), ranked second with 250.3 points, falling from its No. 1 spot the previous week. SBS TV’s “Legend of the Blue Sea” and “Dr. Romantic,” both halfway through their runs, came in at third and fourth, respectively. Among noteworthy gainers, MBC’s Saturday comedy show “Infinite Challenge” climbed five notches to rank fifth and KBS 2TV’s weekend family drama “The Gentlemen of Wolgyesu Tailor Shop” pulled off a whopping nine-spot jump to come in at eighth. “Running Man,” SBS TV’s weekend variety show nearing the end of its run, fell one spot to ninth. MBC’s “Weightlifting Fairy Kim Bok-joo,” which airs its finale this week, slipped three notches to rank 10th.